Chieftaincy is a key institutional feature in Upper West Africa. We discuss how various levels of chiefs serve as brokers between all four of elementary institutional orderings. Especially, chieftaincy links the formal government hierarchy and the village enclave. We provide both a historical and contemporary account of chiefs and delve into their role in the success (or failure) of development projects, look at attempts to transform chieftaincy through attempts to make chiefs more inclusive and democratic, and their important role in helping communities cope with shocks, such as the Ebola virus crisis of 2014–2015. RFI. 2014. http://en.rfi.fr/africa/20141118-local-chiefs-refuse-be-blamed-spread-ebola-sierra-leone-interview, 9 November. Accessed 18 Mar 2018. Voors, Maarten, Erwin Bulte, Andreas Kontoleon, John List, and Ty Turley. 2018. Chief for a Day! 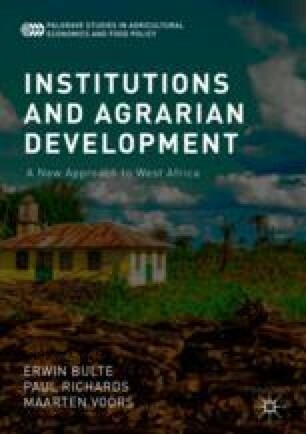 Participatory Development and Elite Capture in Sierra Leone. Management Science. Articles In Advance, Published Online:11 Dec 2017. https://doi.org/10.1287/mnsc.2017.2866.